The famous Oktoberfest in Munich is celebrating it’s 200th Anniversary. The festivities- drinking beer, eating bratwurst and watching women in dirndls – started yesterday and will continue until, well… October. 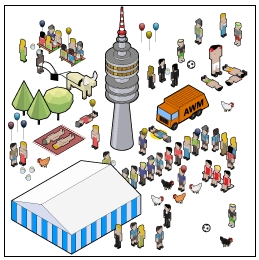 Students of the University of Applied Sciences in Potsdam created some kind of advent calendar with all kind of information for visitors of the festival in pixel art. Functional? Probably not. But for sure nice to click through.